"I try not to get too caught up in who I am," says Janelle Monáe, her signature hairdo a wedge of nappy-chic, small legs crossed primly, hands clasped at the knee as if she were sitting at a tea party for the queen. "I try to find that balance of taking care of self and being selfless. [But] I do find comfort in embracing things that might make others feel a little uncomfortable." Yeah, that comes across. Since the 2007 release of her debut EP, Metropolis Suite I of IV: The Chase, Atlanta-based singer and performance artist Janelle Monáe has been producing wildly unleashed conceptual music, if not especially of the sing-along-in-the-car variety, and serving up live shows that seldom fail to arouse genuine astonishment and admiration from fans and critics alike. She is a psycho-inferno of talent with Tasmanian Devil energy, ferocious charisma and big ideas. Trust me, you're gonna want this one on your team come the apocalypse. Already much has been written about Monáe's influences, both aesthetic and musical -- Grace Jones, Andre 3000, Donna Summer, David Bowie, P Funk -- and indeed, her Afro-futuristic-alternative sound (which earned her a 2008 Grammy nod for her song "Many Moons") includes a good deal of easily identifiable elements. Ironically, though, Monáe didn't listen to a lot of music growing up. "Honestly, I didn't," she says, perhaps a little surprised herself in retrospect. "I wish I had." Instead, she recalls having always sought out quiet spaces as a child. "I've always loved silence. I've always tried to find those places where there was not a lot of chaos going on." For Monáe, who is no joke about what she wears (currently only black and white--usually a white shirt, black tie, black pants and saddle shoes), uniforms have come to represent her rejection of chaos; they are the anti-chaos--the walls against which her anomalistic mind can push while she goes about creating and maintaining the persona that is Janelle Monáe. "I have always taken to uniforms," she explains. "I loved watching the guys and the girls in their post office uniforms. And I was obsessed with Colonel Sanders." For a minute, it's hard not to think that this all -- the hair, the outfit, the measured responses, the compelling eccentricity of her sound and approach -- could just be a shtick; an ironic and affected put-on by a smart, enterprising young woman who likes attention, has just signed with Diddy's Bad Boy Records, and is ready to launch and make bank. Colonel Sanders? How does a brown-skinned girl growing up in "one of the poorest counties" in rural Kansas, with hardworking parents (her mother was a janitor and her father was in the Air Force) become obsessed with Colonel Sanders? "I just idolized his outfit, and it was the weirdest thing to people around me, because they didn't understand. We would go get KFC and I'd be like, 'Oh, my God, I love his outfit!'" So much that she tried to re-create it as a kid -- mostly in her mind, though, because, "when you're a kid, you don't really want to go there. I was a little afraid that people would be like, 'Why is she wearing this all the time?'" Clearly, she got over that. Later on in grade school, she wore a cape for three straight months, and dressed as a pirate for two. It took forever to find the Wondaland Arts Society, the artist collaborative and record label that Monáe co-founded with her like-minded friends and "thrivals" (a term borrowed from black futurist Nat Irvin II that refers to "the first generation of blacks... able to see the world through a global lens unfiltered by their own nationality, ethnicity, or culture"). Wondaland serves as a recording studio, a "mystery school" and a place for the 23-year-old sound pioneer to host frequent paint parties. Monáe, who often includes a painting portion in her live performances and cites Salvador DalÃ­ as a recent source of inspiration, regularly invites about 50 people over, gets a bunch of canvases and buckets of paint, and they all just vibe on painting for hours at a time. My cab driver goes around and around in circles looking for a recording studio hidden inside a gated condo community outside of Atlanta proper, and suddenly I am reminded of the time I met Lauryn Hill at her home (during the peak of her fame), which, come to discover, is a regular old colonial in the Jersey suburbs. There was this sense of disappointment and disbelief that someone who wielded such a spectacular creative impact would choose to live in such an overwhelmingly ordinary place. I expected (and kind of hoped) to roll up to Wondaland Arts Society and see a caterpillar smoking a pipe on a mushroom. Instead, we pull up to a plain, large duplex and I am greeted by Kellindo Parker, Monáe's bassist and concept collaborator, who, wearing a sleek black bob wig, dark sunglasses and the requisite I-am-associated-with-Janelle-Monáe black-and-white attire, could probably pass for an Alice in Wonderland character... circa 2045. Parker is immediately friendly and welcoming, all smiles and good karma. He leads me down carpeted stairs into a basement that is darkly lit with tints of red and looks more like a post-modern gallery experiment than a recording studio -- vintage carnival popcorn and cotton candy machines, a giant fish tank, a few ferns, framed photos of Jackie O. and Albert Einstein, and several stacks of books that include titles like Black Skin, White Masks by Franz Fanon and Outliers by Malcolm Gladwell. Monáe arrives carrying a small paper plate of Chinese takeout that she barely touches throughout the interview. We talk about her upbringing and inspirations, and her decision to take a different path from that of friends and family still in Kansas. "I had lots of cousins, even friends I'd gone to school with, who right now don't understand their purpose, they haven't figured it out," she says. "I make sure to call back to Kansas, just to stay connected. [But] I realize that if I'd stayed in Kansas and kept around those who are like the walking dead and didn't understand where they were going, I could have been that." So she decided "to hang out with people who responded to me," and moved to New York, where she attended the American Academy of Dramatic Arts for about nine months before then moving to Atlanta to get in on the creative what-up that peops like Outkast had going ... and to reprogram the universe. 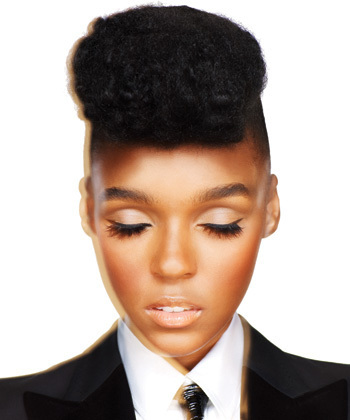 "I think this world has been programmed," says Monáe, "you know, The Matrix, that whole story." So it's a Matrix thing? "I honestly believe there are certain feelings I want to redefine. I mean, early on, from wearing uniforms and things, it's not that I wanted to get attention -- I've always wanted to fight for the right to be free." Very good then. That does not, however, explain the small matter of Cindi Mayweather. Oft misidentified as Monáe's alter ego, Mayweather, Monáe insists, is very real and very much her own identity. "People always get it mixed up, but no, she is an android in Metropolis." An android that has fallen in love with a human, which is so not the move when you live in Metropolis, a place that is somehow visitable by certain people -- Monáe and her crew included -- but unknowable to most. But where is it exactly? "I can't tell you that," says Monáe, in all seriousness. "But I'd love to take you one day." Monáe recognizes that producing a concept record that narrates the plight of an android can be a risky undertaking for a new artist, but she believes it to be worth it, because ultimately, it's not really even about her. "I just felt like [Cindi's] story was so important to tell that I didn't really care if anybody got to know Janelle Monáe. That's where the selflessness comes into play. [Cindi] has been dealing with a lot of social injustice in Metropolis, and I want to make sure that, hopefully, her story can help alter history and save our future." And I want so badly to believe her, to get there with her, but I'm one of the few, the proud, the chosen, who has actually never taken hallucinogens, so it's tough for me to even fake it. Former Village Voice columnist and Afro-Punk guru Greg Tate (who likely has taken hallucinogens), says not getting it might be a good thing. "Socially she is a true Midwestern sweetheart," Tate says (and rightly so), "but still something of a woman of mystery, which is rather refreshing." Toward the end of our interview, Monáe invites me to stay while she records part of a new song, "Mushrooms and Roses," a Hendrix-esque, eroto-phonic ballad about a place for androids to live out their fantasies. I do, and to be sure, her voice is magnificent and she is extraordinarily talented. But so are thousands of other people... in New York City alone. Maybe if they wore provocative uniforms and went on about space travel, they'd get signed to Bad Boy/Atlantic Records, too. "[Yes], there are a lot of good singers out there. 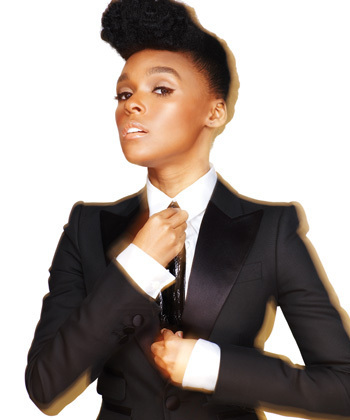 But [Monáe's] a rare breed of entertainer," says Paste magazine editor-in-chief Josh Jackson, an early Monáe supporter. "Her image is a part of it, but that's only a part. When she gets up on stage, the way she dresses and dances and tugs that spectacular hair are mesmerizing. But it wouldn't mean much if she didn't then wow you with her voice and her songs." And here's the thing: You simply cannot know this to be true until you are in fact lucky enough to see her perform live. That's what changes it all. Until you see Janelle Monáe stand on a chair, body electric under the heat and glare of a spotlight, belting out some enormously over-the-top combination of peculiar notes and sounds--soulful, tender and enigmatically charged--before then jumping out into the audience to crowd surf, you have no idea how otherworldly she really is. A few days after our interview in Atlanta, I did see Monáe perform at The Music Hall of Williamsburg in Brooklyn, and suddenly, figuring her out didn't matter so much. Janelle Monáe is a self-invented wonder-child on a mission to beam out rays of love and art. And Lord knows we could use more beings like that in this world. Even if we have to borrow them from Metropolis.